Having been near certainties for relegation through the first three months of the campaign, Arsenal’s exploits through the winter months of the 1922/3 season had left them in a much healthier position. The eight consecutive league games against last season’s top four at the very start of the season had taken their toll, but ultimately with an established team that hardly varied from one match to the next, Arsenal had climbed their way up, if not to mid-table then at least within a point of that position (although, as we have noted throughout this season, having played a couple of games more than the rest). And in looking at the table we might perhaps pause to reflect on what had happened to those top four from last season who had made Arsenal’s opening matches seem such a tough call. Arsenal in fact won just three of their first eight games played twice each against Liverpool, Burnley, Tottenham and Cardiff and that had presaged a sink to the bottom of the table. Now nearly three quarters of the season played Liverpool were once again top, Tottenham were 9th, Burnley 11th and Cardiff 18th, with Arsenal sitting in 14th. Novibet Sports would have given good odds had they been around!! The first event of note in the month came on 2 March with the transfer of Henry White to Blackpool – and this is an issue dealt with in the last article. White continued to make trouble for Arsenal and indeed every other club he played for, and we shall take up his story again later. But let us now let us return to matters on the pitch. March in terms of matches began with an away game against Middlesbrough on 3 March who as we can see above were sitting alongside Arsenal in the league but with three games in hand. It was not a good start to the month as Arsenal lost 0-2. Now if you have been following the reports of this season thus far, you will know that Arsenal had managed two victories, a defeat and a draw in each of January and February, and it was this form (not earth shattering by any means but a huge improvement on one win in 12 from mid-October to just before Christmas), which had taken the club away from the threat of relegation. So a 0-2 defeat on its own was hardly the stuff of disasters, but it meant that if the recent record was to be maintained Arsenal had to survive the rest of the month without any hiccups. The team for the Middlesbrough match reflected the new Arsenal – unchanged from the last game in February save for Toner replacing the not always available Dr Paterson on the left wing. One week on, on 10 March, the return match was played, and this time Paterson was back on the wing, and the rest of the team was left the same. And that stability once more paid off with Arsenal securing a 3-0 victory. The crowd was a trifle disappointing at just 25,000 but a hattrick from Turnbull certainly warmed them up. Since his conversion from left back to centre forward (yes, really) Turnbull had scored in nine of the 18 league games he had played in. A 50% scoring rate is considered ok these days, but Turnbull had done more than that. He had actually scored 18 goals in 18 goals, including two games where he knocked in four! When he had his scoring boots on it seemed nothing could stop him. Of course, having played the top teams from last season in the early part of this season, Arsenal were due to play some of the lower clubs in the hierarchy, and this was certainly now the case with two games against bottom of the table Oldham. Not unexpectedly therefore, 17 March saw Arsenal complete another victory – this time 2-0 against Oldham, with the crowd back up to its 30,000 level, which now made it two wins and one defeat in the month. The team was again much the same except that Bob John dropped out as he had been selected for the first time to play for Wales (thus showing how quickly his star was rising) and Tom Whittaker replaced him. The following Monday, 19 March an international match was played at Highbury, resulting in the score England 6 Belgium 1. The fact that Highbury was chosen was perhaps in part because of the strong links Sir Henry Norris had established with the Belgian community who were exiled in Fulham during the war – we may recall that members of that community returned to Fulham after the war specifically to thank the mayor for his support for them during their exile. There was then a sign that the difficulties that undoubtedly had existed between Arsenal and Liverpool (following Henry Norris’ report of match fixing in 1913) had now been completely forgotten as on 21 March the directors of Arsenal and it seems many of the first team squad, went to watch the Grand National as guests of Liverpool. 24 March saw the return match against Oldham. Bob John returned to the side – otherwise there were no changes. A goalless draw was the result, which given the opposition’s lowly status may have been a disappointment for Arsenal – but still every point was worthwhile. It took Arsenal up to 13th, although with the usual caveat that a lot of other teams had anything up to three games in hand on Arsenal. The final game of the month on 31 March was at home against Aston Villa, and a bumper crowd of 45,000 turned up to see the game. Villa had no chance of winning the League – they were fourth, and Liverpool were certainties to win the title again. But Villa were always a big draw and this made the 2-0 victory over them all the more satisfying. Baker and Blyth got the goals; the team was unchanged from the previous match. Sadly other results and the using up of games in hand meant that Arsenal did not advance further up the league but even so they were now well clear of the thoughts of relegation that had haunted them for the first part of the season. Here is the end of the month top of the table, showing Arsenal just two points below seventh place. And so Arsenal moved into the last month of the season feeling comfortable in their position in the league. 14th was hardly an exciting position to be in, but it was a lot better than might have been expected before Christmas, and after the relegation scare of the previous season it was very welcome. And it was about to get a little better as Arsenal started the month with a game against Blackburn who were two points and one place below Arsenal. Baker dropped out and McKenzie came in and scored in a 1-1 draw at Highbury. A second consecutive 1-1 draw the following Saturday 7 April left Arsenal 9th in the league as the clubs above them slipped up in their games. What is interesting at this point is that Knighton clearly felt safe enough to start experimenting with some previously untried players, the first of which was John Clark at outside right in place of Jock Rutherford who was injured for the rest of the season. Clark had arrived in March from Bo’ness for £150. He lasted three seasons with Arsenal where he played mostly in the reserves, managing just six first team games. The following Monday, 9 April, Athletic News ran an article on Arsenal, complimenting the club for standing out against the reckless financial approach of some other clubs, in the matter of transfer fees, and described Arsenal as an “object lesson” in how to run a club within its budget. And interesting a week later Arthur Bourke, writing as always as Norseman in the Islington Daily Gazette took up the theme and praised the club in the same manner. A local journalist copying the theme from a weekly magazine; whatever next! But to be fair the Gazette updated the story by considering the match of that weekend – Arsenal 1 Preston North End 1 on 14 April. In the Preston side was Tommy Hamilton whom the paper described as a £4500 transfer. Other sources quote a fee as much as £1000 lower when he moved from Kilmarnock to Preston in 1920, but either way that sort of money was not what Arsenal were paying for their players. Preston ended the season five points and five places below Arsenal, suggesting indeed that money was not everything. Sir Henry Norris was known to one and all as a man who was opposed to escalating transfer fees, while being in favour of having no maximum wage for players. These stances were typical of the man’s views; he wanted just rewards for the working man, and not huge sums (as they were at the time) moving between the rich owners of the clubs. In this regard Athletic News was with him – as indeed it was on many subjects, and as we have seen it was over the election of Arsenal to the 1st Division in 1919. But although Sir Henry put forward the notion of a restriction on transfer fees and no maximum wage several times, the other clubs (all, by now, run by men as rich as, if not richer than, Sir Henry) said no. It was one of a growing number of themes in which he was out on his own. As for the home game with Preston on 14 April that ended in a 1-1 draw, not the most impressive result perhaps but one that meant Arsenal were now unbeaten in seven consecutive league games. Given that they had gone eight without a win earlier in the season, this was something to behold. This match also saw the introduction of another new player: Elvey at right back. Again the player was not destined for great things. Having come from Bolton this was his one and only game for the first team. On 16 April Arsenal played a friendly against Clapton Orient. I’m not at all sure what the purpose of the match was, although it might have been simply to help Orient’s finances. Certainly Orient had had a tough season but did manage to finish 19th out of 22 and so avoid relegation to the Third Division South. The return match with Preston was the following Saturday, 21 April and this continued the positive run, with the match ending Preston 1 Arsenal 2. 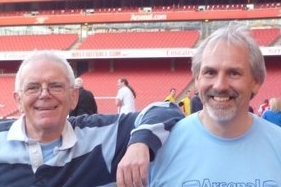 At inside right Arsenal introduced yet another new player: Stanley Earle, and lo and behold he scored one of the goals. Now Stanley Earle is a bit of a mystery to me. It seems fairly clear that he joined Arsenal as an amateur and he played one game in the 1921/2 season on 18 March. All told the records show he made four League appearances for the club, scoring three goals, but it is said he had his registration cancelled in July 1924. However the records also show he won the Amateur Cup with Clapton in 1924 before joining West Ham at the start of the next season. And so we have three players being tried out: Clarke, Elvey and Earle, but none of them made it. In one sense we can say that is a failure, but in another, it could be said the manager was using the end of season games to take a look at the reserves that he had in the club. Which brings us up to the last game played on 28 April, the day of the cup final at Wembley, film of which I included in a previous episode. At Highbury it was Arsenal 2 Sheffield United 0 with Clark getting his second run out, and Arsenal down to nine men by the end of the game after some interesting tactics by the United players. In his column on 30 April in the Gazette Arthur Bourke continued his warm theme saying said Arsenal’s form since Christmas had been the best in division. What’s more Arsenal had just won the London Combination with one match to spare. They also had the honour of the highest away win of the season, 0-5 on 1 January. Leaving aside the Clapton friendly, Arsenal had just gone nine games unbeaten, exceeding the eight without a win earlier in the season. They also had the honour of recording the biggest away win in the season with Blackburn 0 Arsenal 5. In the second division Notts County and West Ham United were promoted. For the first time since the resumption of football after the war, Arsenal were the top club in London, beating both Tottenham and Chelsea to that honour. Indeed, thanks to that final run Arsenal had finished in 11th, a result that made Arsenal look like a solid, mid-table first division club, given that the post-war positions were now recorded as 10th, 9th, 17th and 11th. That 17th and the early flirtation this season looked like aberrations; with a settled team Arsenal could indeed hold their own. Surely Knighton had learned his lesson: endless tinkering with the team was neither clever nor helpful. What’s more the club could pick up big crowds for big games; 50,000 had attended the Tottenham game, and 45,000 for the first game of the season against Newcastle. Chelsea brought in 38,000, and the good news was that the two London rivals were still in the League, and would guarantee big crowds again next season. This article is part of the series Henry Norris at the Arsenal. You can see a full index of the articles in the series here. However Perhaps the most popular element in the Norris story is that of Arsenal’s promotion to the first division in 1919. The most complete review of this, which puts right the numerous misunderstandings of the events of that year appears, and most importantly cites contemporary articles and reports, such as the minutes of the FA meeting where the promotion was confirmed, and the reports in local papers thereafter, is set out below in these articles.